This time around, we have an avant-garde bash at getting the levels right and then expert In-Store Radio producer Toby Huggins from KVH Media takes us on a trip all over this under-lauded industry. He also reveals the details of a party he's planning in the aisles of a high street store near you, AND we launch our competition! You can win TWO brilliant prizes (info in the podcast), and all you have to do is write a review of our show in iTunes then email us on vosocialnorth@gmail.com to tell us you’ve done it. The voices you hear in Show Offs Corner are: Nic Redman - Co-op Kate Whelan - Asda Sara Davies - Matalan Jessie Brooks - Spar Tony Collins - Dobbies Justine Harris – Asda And if you’d like to feature next month, (of course you do, what a redundant if) email us your stuff! The North played a blinder at the VOX awards 2018, with a load of nominations and an outstanding TWO wins by Cumbrian lad Jack Oddie, so we called him up to get his perspective on regional accents taking over the commercial mainstream. Also in this episode, Manchester based video production company Bearded Fellows smash through some frankly savage home truths about how they cast voices, and Leah gives Nic a terrible Christmas present. Boz talks in this bonus episode about casting, music, sound design, authenticity and purpose in Holy Mountain's "Billie Homeless Dies At The End", "Saving The Blue", "Hay El Matar" (back on BBC Radio 4 from November 19th) and "The Good Listener" (which is being repeated on BBC Radio 4 on 12th September 2018) Episode 14 of the podcast will be published in December - send your VO work to vosocialnorth@gmail.com to be considered for Show Offs Corner! This VO Social meets… episode features major UK animation casting and voice director Dave Peacock (who says some frankly astonishing things), a bag of shiny voxes from the One Voice Conference 2018 AND we introduce our new segment, Show Offs Corner. Send VO related MP3s of stuff you’re proud of to vosocialnorth@gmail.com, also email us to get your name added to our newsletter! AND you can follow Nic @NicRedmanvoice, and Leah @Leah_etc if you fancy it. In this episode, we meet extraordinary Manchester based sound designer Eloise Whitmore, find out what a half decent radio drama actor sounds like, learn what the future holds for our ears, and Leah says two things she probably shouldn't. ALSO, we announce some HUGE NEWS for the social on the 10th March! We don't say HUGE NEWS lightly you know, we've checked with thesaurus.com and that is actually right. In this aggressively festive episode, Leah and Nic explain exactly what's expected of the next social's attendees, and award winning audiobook reader Dave Thorpe tells Plog what's what when it comes to reading those audiobooks. 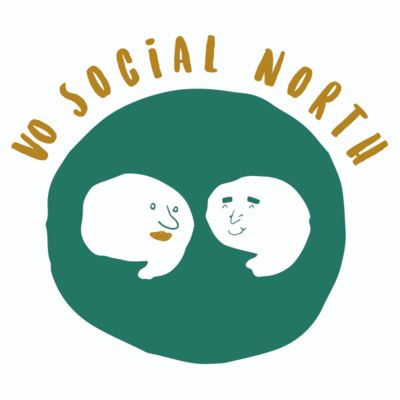 Email vosocialnorth@gmail.com to be added to the mailing list, and follow us on Twitter @VOSocialNorth. Ho ho ho! In this Plog Meets... episode we journey out to a little stone cottage in the countryside to chat to our Melissa... She's been a pro voiceover and a radio drama regular for ages and has some extremely interesting things to say about all of that. Sign up(if you haven't already) for more interviews with fascinating audio experts - email vosocialnorth@gmail.com and we'll pop you on the mailing list. 8. You've worked for WHO?!! The 8th edition of the ever popular VO Social North PLOG. This month we brag unabashedly about the excellently talented people who come to hang out with us at our voiceover social meet up in Manchester. To celebrate April Fool's Day, we've compiled ludicrous voiceover stories from the professionals that attend our socials. Also featuring a coordinated attack by the swarming street sweepers of Salford. The talented and well established voiceover industry folk who come to our dos share the most useful secret tip they're prepared to give away. 5. Happy Oneth Birthday to us! Find out all about the astonishing shenanigans Nic got up to when she turned one, feel the birthday love in stereo and open your special birthday present from us. All in under two minutes. 4. Do you feel fonder? We take a stroll through the grimiest bit of Manchester's Northern Quarter and talk about how nice it's going to be when we all see each other at Mr Thomas' Chop House. 3. We love the North a LOT. The first ever social went so well we're going to do it again! So we go for a walk in the wind to discuss why and how, also when, although not where. 1. What is all this? Nic is a voiceover, voice actor and vocal coach, Leah is a voiceover, voice actor and radio news reader. We met on the internet over a wayward apostrophe, accidentally both moved to Salford and then set up a thriving social for voiceovers across the North of England. This is the first episode of the podcast we make to promote it. Nice to meet you!